Novation has just released its new Launchpad a compact controller which is designed to give electronic music makers the most interactive experience possible while using Ableton Live. The 8×8 grid of backlit buttons control a multitude of functions with the help of mode selectors that allow the user to navigate teh Ableton interface from launching clips to tweaking mixer settings. 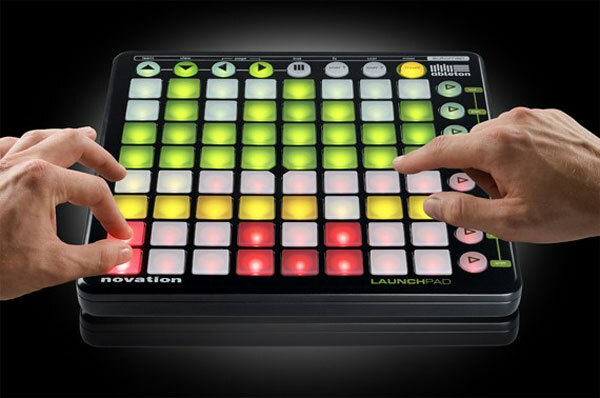 Launchpad’s raison d’être: launch, pause and flip between clips at the touch of a button. Each clip has its own button, with a multi-colour, variable-brightness LED to display its status: an amber button tells the user that a clip is loaded, green means it’s playing, and red means it’s recording. Dedicated buttons provide shortcuts to the different areas of Ableton’s control window, including the Session View, the Mixer and the Instrument racks. A feature that allows the user to jump around eight-channel sections of the Live session, allowing for easy navigation of larger configurations. Launchpad is the ideal controller for Max for Live, the extension of Ableton’s software that “puts the power of Cycling 74’s Max/MSP inside Live”. • Launchpads work seamlessly in a team! Up to six Launchpads can work together on the same system. What’s more, a Launchpad will happily provide additional functionality alongside any other MIDI controller, such as one from Novation’s SL MkII series. Use a Zero SL MkII to control the mix, with a Launchpad to trigger clips. Although it’s designed for the ultimate control of Ableton Live, Launchpad can be used to control any music application, as a standard MIDI controller.